Egypt is anticipating its biggest wave of protests since the January 25 Revolution, this time calling for Islamist President Morsi to step down and for early presidential elections. Ahram Online looks at the plans of the opposition, the Brotherhood and the people. President Morsi became Egypt's first democratically-elected president on 30 June 2012, however, his performance did not please many, including some factions that actually supported him in the final round of the presidential elections against Ahmed Shafiq, Mubarak's last prime minister - who was perceived by revolutionary groups as an extension to the old ousted regime. Once allies in Tahrir Square for 18 days in 2011, the liberal and leftist parties and groups are preparing for a face-off with the now-ruling Muslim Brotherhood president, his party and a number of Islamist forces who decided to back him in his war for "legitimacy." Protests have already been breaking out a week in advance of 30 June in Cairo, Alexandria and several Egyptian governorates, including Daqahliya, Sharqiya and Zagazig. Fierce clashes broke out in Alexandria, Egypt's second city, often ending in clashes between the president's supporters and opponents. This alarmed many activists and politicians who repeatedly called on all parties to remain peaceful. Islamist forces are currently staging a sit-in at Rabaa Al-Adawiya Mosque in Cairo's Nasr City that they started on Friday in support of Morsi (see video here). They held a similar rally last week, which numbered in the hundreds of thousands. Also on Friday, tens of thousands of anti-Morsi protesters gathered in several parts of Cairo and marched on to (see video here) Tahrir Square - the flashpoint of Egypt's revolution. Tamarod ('Rebel' in English), a signature drive claims to have gathered now over 22 million signatures asking Morsi to step down. As Sunday approaches, the anticipation is palpable in the eerily empty streets of Cairo, since many Egyptians decide to weather out the future-decisive events at home – either out of fear or inability. After days of the longest gas queues at stations under rumours of shortages, some gave up, parked their cars and stayed at home. Also after days of long queues in supermarkets, it seems most middle and upper classes have secured their goods for the coming week or two, in case hell breaks loose and supermarkets close or they can't leave their homes. "I bought everything I need, from pasta, to vegetables, I stocked the house so that we can stay at home and watch the revolution on screen," said Jihan Mohamed (40) who hasn't decided if she will join the protests yet. Mohamed voted for Morsi in the second round, and says: "I regret it, I never thought these people will starve and harm the country the way they did. Where is their religion?" Mohamed asks angrily while buying bread loaves from the crowded bakery in the downtown district of Shubra. Mohamed's father was stuck in Egypt's Delta Nile area for the past three days until he found gas to fuel his car and return to Cairo. Security is a main concern for many of the first-time protesters. A retired architect, Hassan Darwish (70) will protest for the first time in his life, along with his family, on 30 June. "I don't feel safe anymore, I almost don't sleep, always worry about my girls and grandsons. I wake up in the middle of the night to check on the locks of doors and windows," Darwish added after a meeting with his fellow first-time protesters, who just ended their prayers in a mosque in the satellite suburb of 6th of October. "We will meet after the afternoon prayers and drive our cars to Juhayna Square to gather with the rest of the 6th of October residents, then drive to Tahrir or Ittihadiya depending on how the day will go," added Darwish confidently. Security is tight in many areas with troops deployed in Cairo and elsewhere. Barbed wire and intense security checking cars and people are present in front of shopping malls, companies and buildings. Military troops are also deployed in crucial areas. Most banks, companies, public and private businesses have advised their employees to take 30 June off from their annual leave for their own safety. In a three-hour-long televised speech on Wednesday, President Morsi failed to give assurances to the opposition. He thanked the military, the police and both thanked and attacked the judiciary. The president defended his performance, admitting errors and promising reforms to address them. He blamed his failures on Egypt's external and internal enemies and remnants of the old regime, who he accuses of hating to see Egypt on the democratic path. "I took responsibility for a country mired in corruption and was faced with a war to make me fail," he said. In Morsi's speech to the nation he also described acts by politicians, judges and journalists – whom he pointed out by name - that he believes want to "turn the clock back" to the Mubarak era. "Egypt's enemies have spared no effort to sabotage the democratic experience." President Morsi called on opposition figures to take it to the ballot box if they want a change in government and criticised them for refusing to take part in a national dialogue. Morsi also warned the media not to abuse free speech. Within hours, ripples from the Islamist president's speech could be felt across Egyptian media. A talk show on the Al-Fareen TV channel ended abruptly on Thursday night when the presenter learned he was to be arrested. Host and owner of the channel, Tawfiq Okasha, is accused of spreading false information and the channel has ceased broadcasting. Another prominent presenter resigned on air on state-run television in protest at what he called "government interference" in the editorial content of his programme. Owner of Al Nahar and CBC channels, Mohammed El-Amin, was banned from travelling after Morsi referred to him by name in his speech, claiming that he failed to pay his taxes, "that's why his channel is targeting the president and the Brotherhood," said the president to an all Islamist crowd who cheered "purge the media." El-Amin later denied any wrongdoing. In a statement, Egypt's largest opposition umbrella group, the National Salvation Front (NSF) said it "remained determined to call for an early presidential election." "We are confident the Egyptian people will come out in the millions to hold peaceful demonstrations on all of Egypt's squares and streets to realise their aspirations and to put the January 25 Revolution back on track," it added. "The president's address [to the nation] reinforced Egyptians' belief that Morsi is not capable of filling the position of president," the NSF asserted. Military forces began deploying nationwide on Tuesday, with Defence Minister Abdel-Fattah El-Sisi saying earlier this week that the army had a "moral responsibility" to "stop Egypt from slipping into a dark tunnel" of political violence. The Supreme Council of the Armed Forces (SCAF), headed by former field marshal Mohamed Hussein Tantawi, assumed power between February 2011 and June 2012 after Hosni Mubarak's ouster from presidency. SCAF rule was followed by the election of Brotherhood-fielded Mohamed Morsi to presidency. Several protests were held in front of the Ministry of Defence calling for El-Sisi to assume power from Morsi. The questions buzzing every day on the streets, talk shows, Op-eds and analysis pieces re: Who will the army side with? Will they reassume power? Will they remain neutral? In his speech – where El-Sisi wore a typical military poker face from his seat in the audience - Morsi asserted that he is the head of the armed forces and thanked the military for their efforts to protect Egypt borders - trying sending a message that the army is on his side. However, on many occasions the military sent a message that it is not part of any power struggle and that they are only on the side of the people. A question that should supersede all others, however, is whether military is willing to assume power again if they see uncontrollable violence, especially after all the criticism they got from politicians, activists and human rights organisations when they assumed power after Mubarak's ouster. Meanwhile, the Muslim Brotherhood and its allies staged a mass protest last week to voice support for the president's "democratic legitimacy" and also to "say 'no' to violence." Brotherhood supporters stress at the Friday rally what they call Morsi's "legitimacy," and reject the opposition's demand for him to resign. Many Islamist politicians have accused the opposition of giving cover to political violence; others have vowed to respond in kind if Sunday's opposition protests turn violent. As for Morsi's televised speech; the Brotherhood claims it achieved its goals, despite the wide criticism by opposition. The Muslim Brotherhood's Freedom and Justice Party (FJP) Spokesman Nader Omran described the address as "excellent, balanced and badly-needed," in light of Egypt's current political impasse. Several opposition forces released a statement on Thursday asserting that they would not accept the return of former Mubarak-era officials to power as an alternative to President Morsi and his regime. "The revolution will not tolerate any opportunists who aim for personal gain," the statement read, adding "We will not allow for the return of Mubarak [officials] or the military." The opposition forces, which include the April 6 Youth Movement, the Revolutionary Socialists, and the Strong Egypt Party lead by Islamist Abdel-Moneim Abul-Fotouh, said that the January 25 Revolution did not end when the Egyptian people brought down Mubarak in 2011. "The struggle did not stop, because we continue to face the same regime, even if it has a military or a religious façade," the statement reads. The opposition statement described Sunday's protests as a "completion of the revolution and the fulfilment of its goals, from which the president strayed." "We commit to peaceful and popular means to achieve our goals," the statement concluded. A number of public figures also signed the statement, including ex-MP Amr Hamzawy, writer Alaa El-Aswany, political scientist Rabab El-Mahdi, and former presidential contender Khaled Ali, among others. The Rebel movement, aiming to oust President Morsi via a mass petition, proposed a six-month transitional roadmap where executive powers are assigned to an independent technocratic premier. 1. Hand power to an independent prime minister who represents the January 25 Revolution on the condition that he does not run in the first upcoming presidential or parliamentary elections. 2. "The independent prime minister will head a technocratic government whose main mission is to put together an urgent economic plan to save the Egyptian economy and to expand social justice policies," said Tamarod co-founder Mohamed Abdel-Aziz. He also hinted that the premier would not be from drawn from among well-known politicians. 3. "The head of the High Constitutional Court would be assigned the duties of the president according to protocol, where all executive powers are assigned to the prime minister in a six-month transitional period that ends by presidential elections judicially supervised and monitored internationally, followed by parliamentary elections," the Tamarod co-founder added. 4. Dissolving the Shura Council, suspending the current constitution and drafting a new constitution are steps in the roadmap proposed by the newly founded Front. 5. The prime minister will give the National Defence Council the authority to fulfil its national security responsibility towards the country. Tamarod activists and speakers stressed that the 30 June Front does not represent all revolutionaries in Egypt, yet it hopes that it will represent all Egyptians on 30 June. "There will be no flags or banners other than Egyptian flags in the protests as well the photos of Egypt’s martyrs, starting with the martyrs of the January 25 Revolution," leaders said in the conference. As Sunday approaches fear of violence in an increasingly polarised nation of over 80 million mounts. 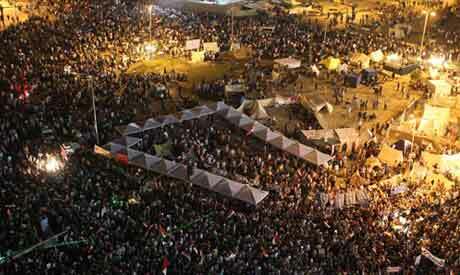 Five have already died in clashes across Egypt between the president's supporters and opponents. Earlier last week a mob of thousands of Salafists killed 5 Shias in a village in Giza - adjacent to Egypt's capital - raising fears of religious violence. The president's failure to mention this in his speech and was widely-criticised. Fear of violence, chaos, looting and mob attacks are rising but all politicians have asserted the need for peaceful protests and that the only way the revolution is to continue is if massive numbers of peaceful protesters hit the streets and announce an open-ended sit in followed by peaceful escalation methods, including a standstill in factories, companies and transportation. He was brought to power as the lesser evil. And that he "commited the most nefarious crimes always abiding by the Law" is a problem. What is a crime and who decides? The victor, isnt it? That is not right time to protest against Morsi. Please give him full time to work. If not ARMY will come again. 25 % Minority NSF team wants know rule Majority ?. No to Mubarak, No to military, No to Morsi as quoted above. Egypt past election statistic shows 50% Islamist, 25% Mubarak Party, 25 NSF. They should add: "NO to the Salafis" as well, because they are behind all of the sectarian (anti-Christian, anti-Shi'a, etc.) violence that has broke out since Mubarak stepped down. "The children shall lead them.." The only ones with a plan and who appear to be working for Egypt are the youth. As Dylan sang, "The Times they are Achanging." I hope the old "elites" and the corrupt soon find their walls are crumbling around them. They had a chance to reform, but did not. The youth really love Egypt. I wish them well. I do support the closing of the US Embassy and the replacement of the ambassador with a station chief running US consular services for US citizens. I also favor an ending of US aid to Egypt. This way the US can no long be blamed for all the problems in Egypt. This is not hostile to Egypt. It is just getting out of Egypt and allowing Egypt to deal with its problems on its own. As things stand now every problem in Egypt seems to be blamed on the US. If one is hopping that a non Islamist would run Egypt before year 2016 I can assure you it's not going to happen. Morsi is our leader and he remains so . Last night someone suggested to have been in touch with USA senate to stop funding to Egypt. Old elite referred here I take means Mubarak and Bradei and the likes. Yes you are right they had far too long misuse of power and had many chances. Islamist now have that chance. Everybody must agree he is given his chance to prove himself . No doubt so far so sweet. Down with undemocratic secularists and fascists a like. NSF/Tamarod plan is a recipe for DISASTER!!! Egypt had elections and there is a democratically elected President in the country that have to serve a certain term. The NSF/Tamarod should direct their efforts in contesting the next elections. Decades of autocratic rule and corruption cannot be undone in a year with the oppostion not giving the President a chance to do his job and constantly putting stumbling blocks in his way. Seems like the opposition want a Magician with a magic wand to run the country. What the NSF/Tamarod are planning is completely UNDEMOCRATIC and will lead to bloodshed, chaos and anarchy. Learn democracy from countries that had democracy for years, where the elected government is given a chance to serve its full term and where there is dialogue, negotiation and things done is constructive way instead of the destructive way of the opposition and the Tamarod. Morsi's party calls itself the "Freedom and Justice Party" yet wages have decreased and food prices risen since 2011. The government has consistently outlawed and attacked striking workers and demonstrators! The Mubarak appointed officials remain in their positions in the army, the police, the courts, the government departments! Democracy is based on the real exercise of power by the majority of people. This power can only be by mass revolutionary action, not by voting for one of the parties controlled by the rich and then standing aside to be pushed around by the resulting government. Solidarity with the revolutionary mass protests! "democratically elected" in RIGGED elections! what democracy are you talking about? Democracy is not defined by elections only. Adolf Hitler was freely elected and commited the most nefarious crimes always abiding by the Law. Hostory tells us that democracy is weak against attacks from the inside. Islamists are fascist organisations that are abusing democracy as a vehicle to erect a religious horror caliphat without freedom of expression and zero tolerance towrds religious minorities. Egypt must be protected against fanatic hijackers now. If we wait until the Ihwan finally allow elections we will be in the midst of a civil war.